Six games. 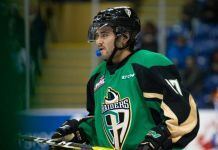 If everything goes according to plan, Gabe Bast has six games remaining in his junior hockey career. Problem is, things haven’t quite gone as planned the last few years. The 20-year-old defenceman from Red Deer, Alta., joined the Penticton Vees for the 2014-15 season and had a stellar rookie campaign, recording nine goals and 40 points in 49 games. In 22 playoff games he added another 13 points as the Vees won the Western Canada Cup and reached the semifinals at the RBC Cup. Things were looking up for Bast. Eight games into his second season with Penticton, Bast began feeling extreme discomfort with inflammation around the pelvis, later diagnosed as Osteitis pubis. The timetable for his return depended on whom you asked: “Things could settle down in a week or it could be nine months,” he was told. Going into this season, the 5-foot-10, 191-pound blue-liner was extremely optimistic the injury was behind him. 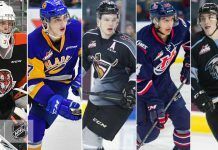 And with this being his final season in Penticton, having committed to the University of North Dakota next year, the goals he set for himself and the team were lofty – but wait, hold on, not so fast. The Osteitis pubis flared up again and led to other issues with connecting muscles and ligaments. Bast played two games in September, four in November and one in January before playing seven consecutive to end the regular season. All in all he played only 14 games this year … another frustrating finish to another frustrating year, right? Bast quickly returned to form, collecting six points over those final seven games, and he carried that momentum into the postseason. Twenty-one games later (one fewer than he played in the last two regular seasons, combined) and Bast, who has six goals and 11 assists in the playoffs, has the Vees primed to win their second national title in six seasons. Bast credits the perspective he gained while continuously trying to overcome his injuries with helping feed his comeback beast. Taking a step back has him appreciating every moment on the ice: every shift, every face-off, and every blocked shot. Whichever Bast it is that Vees head coach and GM Fred Harbinson is seeing these days, he likes. The veteran bench boss is just happy to have his most reliable defenceman back at full strength. So is it safe to say Harbinson is surprised to see Bast at his best so quickly? With Bast and the Vees back at the RBC Cup, one thing is certain: this defenceman won’t be taking a shift off. He doesn’t have that many junior hockey shifts left, after all. “I like our chances. We’ve got a great group, we’ve been resilient throughout the playoffs and it’s do or die now and we’ve responded every time that has been the case this season. We’ve got the squad to do this. I want to win and go out on top.